Analysis o white licht bi dispersin it wi a prism is an example o spectroscopy. Spectroscopy is the study o the interaction atween matter an radiatit energy. 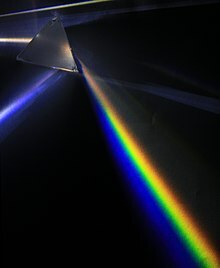 Historically, spectroscopy oreeginatit through the study o veesible licht dispersed accordin tae its wavelength, e.g., bi a prism. Later the concept wis expandit greatly tae comprise ony interaction wi radiative energy as a function o its wavelength or frequency. Spectroscopic data is eften representit bi a spectrum, a plot o the response o interest as a function o wavelength or frequency. This page wis last eeditit on 8 Julie 2016, at 17:25.